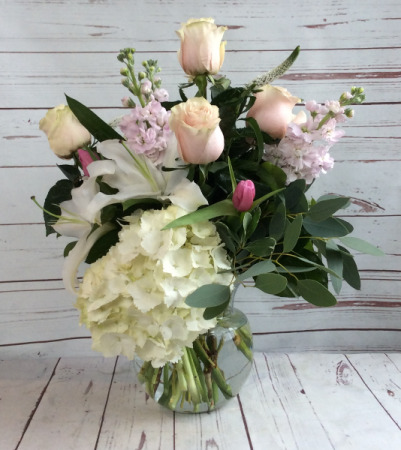 Blush pink premium roses and fragrant pink stock, beautiful white hydrangea, fragrant lilies and tulips accented with silver dollar eucalyptus arranged in a modern optic vase. measure app 18" x12"
Pink Roses, White Orientals Or Gazers, White Hydrangea, Light Pink Stock, Tulips, Silver Dollar Euc, Var Pitt, Salal. 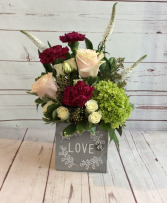 Green Hydrangea, Lp Roses, Purple Carns, White Veronica, White Spray Roses, Var Pit, Seeded Euc.